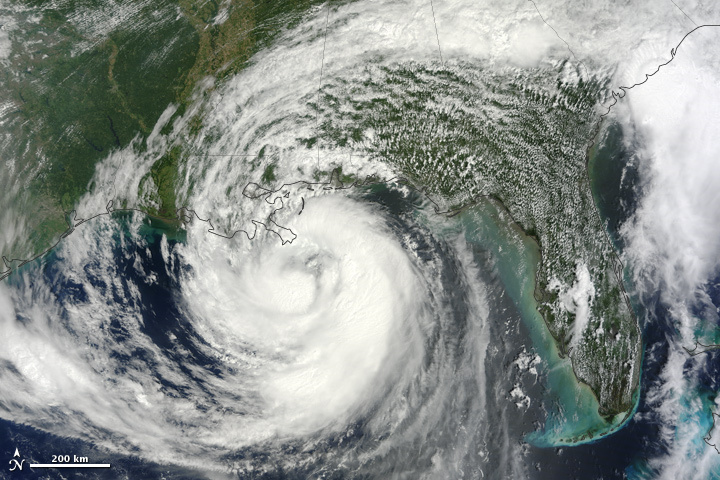 On August 28, 2012, tropical storm Isaac achieved hurricane force and was predicted to make landfall on the Gulf Coast of the United States sometime overnight. 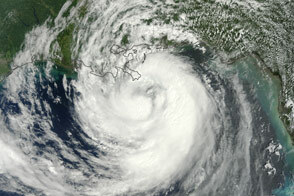 A category 1 storm, Hurricane Isaac approached the Louisiana and Mississippi coasts on the seventh anniversary of Hurricane Katrina. Hurricane watches and warnings were posted from Intracoastal City, Louisiana, to the Mississippi-Alabama border. 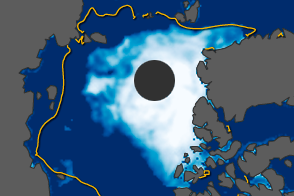 The Moderate Resolution Imaging Spectroradiometer (MODIS) on NASA’s Terra satellite captured this image of Isaac in the Gulf of Mexico at 11:30 a.m. Central Daylight Time (16:30 Universal Time) on August 28, 2012. 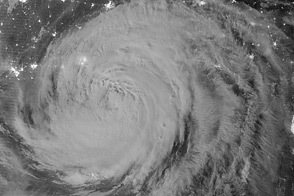 The Suomi-NPP satellite also captured this nighttime view of the storm around midnight on August 27-28. 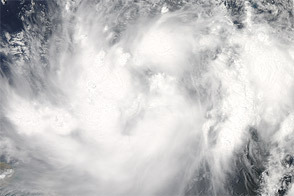 At 1 p.m. CDT on August 28, forecasters at the National Hurricane Center (NHC) reported that Isaac was centered at 28.4° North latitude and 88.7° West longitude, about 135 miles (220 kilometers) south of New Orleans. The storm was moving northwestward toward the mouth of the Mississippi River at 10 miles (17 kilometers) per hour, with maximum sustained winds of 75 miles (120 kilometers) per hour. 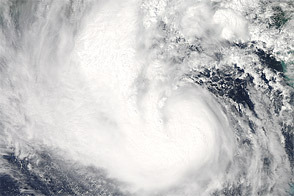 Hurricane-force winds extended 60 miles (96 kilometers) from the center. NHC forecasters expected Isaac to strengthen a bit before reaching shore, and warned of potential flooding from rainfall of 7 to 14 inches (18 to 36 centimeters), with localized precipitation up to 20 inches (50 centimeters). They also warned of a storm surge that could reach 6 to 12 feet (2 to 3.5 meters), depending on the timing of landfall and of local tides. Though just a category 1 storm, Isaac’s slow forward motion had the potential to pile up more water in the storm surge. Winds and storm surges are worst on the right/northeastern side of hurricanes. The five-day forecast suggested that the hurricane and its remnants would head straight up the Mississippi River basin and perhaps to the Ohio River—potentially offering some relief in areas where the river has been exceptionally low. But the heavy rains could also provoke severe flooding, as the parched ground and dried up crops will not necessarily absorb that much water. NASA is just days from launching an intensive multi-year study of hurricane formation and evolution in the Atlantic Ocean. Known as the Hurricane and Severe Storm Sentinel (HS3) mission, the project will use robotic Global Hawk airplanes to fly over and through storm systems. 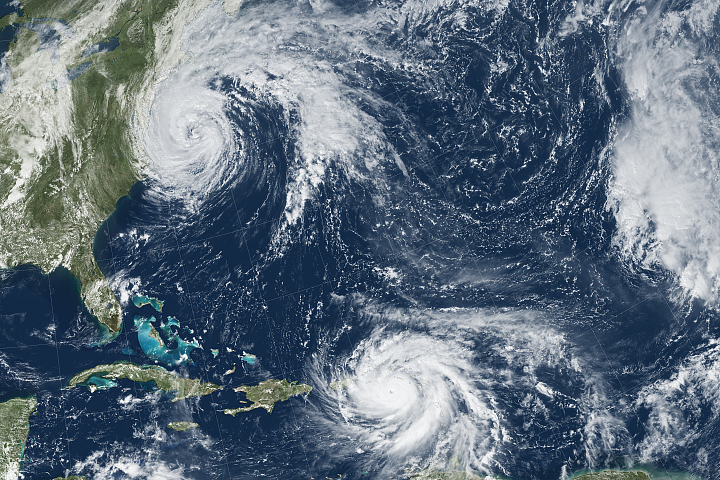 A principal goal is to learn more about what makes tropical storms intensify into hurricanes. 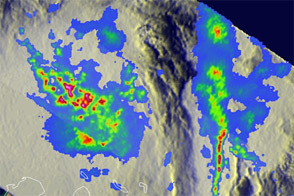 Read a more detailed description of Isaac from the satellite view at NASA’s Hurricane Resource Page. Also, the National Hurricane Center provides the official U.S. storm forecasts and regular updates on conditions on its home page. 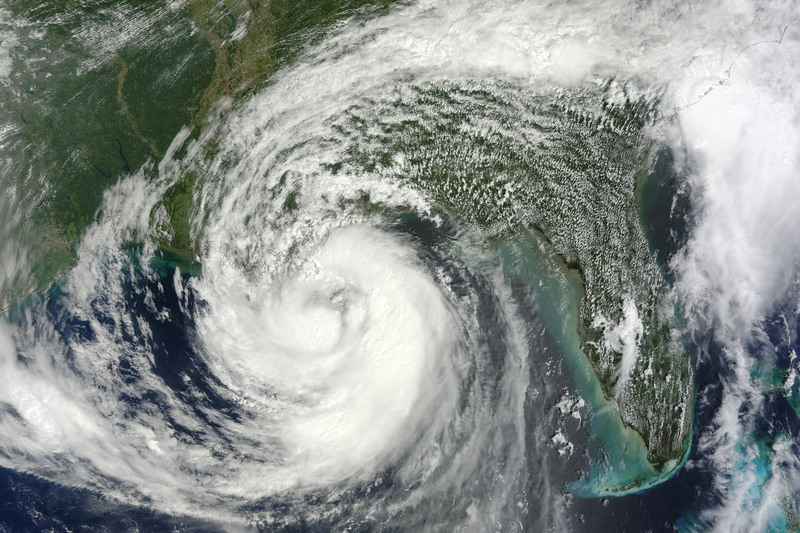 The storm was expected to make landfall on the anniversary of Hurricane Katrina, while marching straight up the Mississippi River basin. 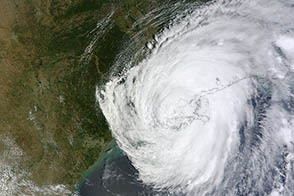 In late August 2012, Hurricane Isaac struck the Gulf Coast and New Orleans, Louisiana.